What if you have whisky casks with talent at a young age? Would you take the risk and nurture the talent and create new range of whisky? This is what the chief blender of Suntory, Shinji Fukuyo had in mind with the Yamazaki Distiller’s Reserve and the Hakushu Distiller’s Reserve. The Yamazaki Distiller’s Reserve has a range of whisky as young as 7 to 8 years of age and as old as 19 years of age. A large portion of the whisky is matured in American hogshead, a small portion in sherry cask and a tiny portion in mizunara oak. On top of that, a small portion of the whisky is finished in burgundy cask for a further two to six months. From the nose, you have banana, lemon, vanilla and tangerine, and strawberries as you would expect with influence from a wine cask. The palate is mildly acidic and lightly spicy with plums and grapes. The finish is subtly dry and tickles the throat a little. whiskytale: In an “alternate” story-world, Dr. Frankenstein had an idea. He creates a creature, but instead of viewing it as grotesque, he was genuinely proud of it. Instead of disavowing his creation, he shared it with the world. The world on other hand is not quite sure what to make of this bizarre individual. In fairness, beyond its appearance is a gentle and kind creature. With time, the world becomes more accepting and in the end, his creation never viewed humanity as intolerant and cruel. Is the Yamazaki Distiller’s Reserve Frankenstein’s creation? Perhaps, and only because you view it as something altogether different to the Yamazaki core range. But if you are willing to break from the norm, the Yamazaki Distiller’s Reserve stands on its own and has a genuine and worthy distinct quality. 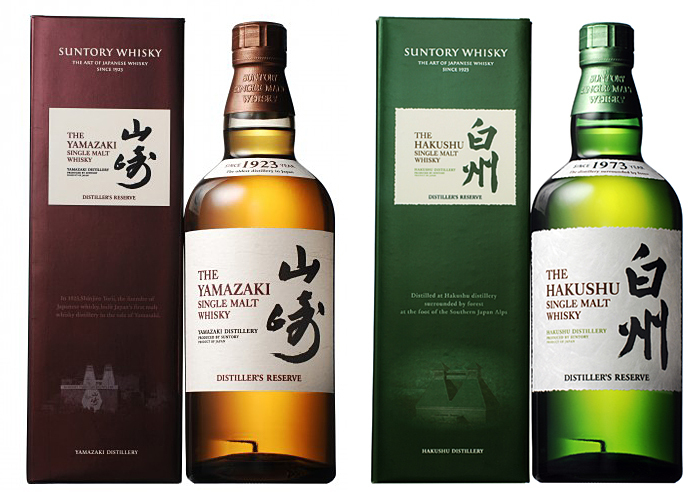 The Hakushu Distillers Reserve has a range of whisky up to 18 years of age. Most of the whisky is matured in American oak with a tiny portion in sherry cask. Hakushu whisky is also known for its light smoky character and this bottling contains a mixture of very light peated barley and tiny amounts of heavy peated barley. From the nose, you have gentle honey, pineapples, lemons, green apples, cucumber and melons surrounded in a medicinal wisp. The palate is dry and woody, and a little nutty. The finish is lightly minty, and is unwaveringly smooth and swift. @whiskytale: You are at the silk store. You know your silk, it is your favourite fabric and love how it feels on you. Drinking Hakushu is like wearing silk, it is so soft and smooth, and you can never quite find another peated whisky with similar character. Before you leave the store however, the owner approaches you and say, he has a new silk fabric recently arrived. You brush him away only because you know what you like. The store owner insist with a smile on his face and claims you will not regret it. He takes you to the back, pulls out this new fabric and ask you to touch and feel it. He has got your attention now. The cloth is so soft to the touch and in your mind, you are thinking this is either synthetic or very expensive silk. This is silk, the owner asserts and then shows you the price tag that blows your mind away at how affordable it is. This is the Hakushu Distiller’s Reserve. If you thought for a moment you love Hakushu for its silky soft character, then the Distiller’s Reserve takes you to a whole new different level.